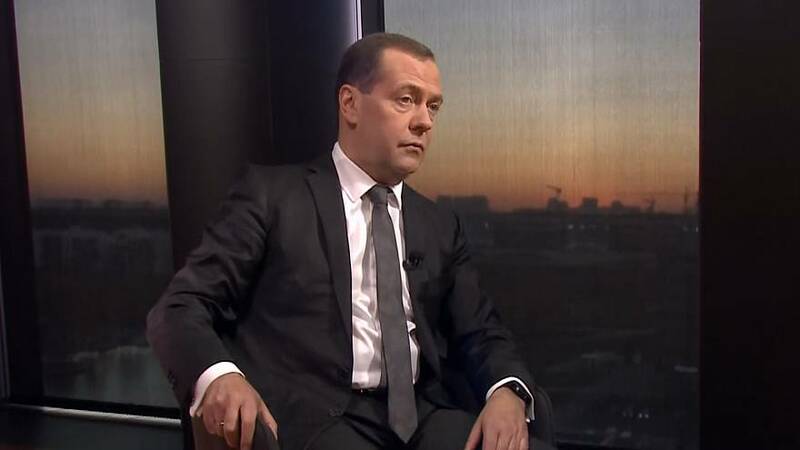 In this latest edition of the "Global Conversation" euronews has an exclusive interview with the Russian Prime Minister, Dmitri Medvedev. "Let's start with the fact that you're going to be meeting your European counterparts in Brussels very soon. Earlier this month EU Council President Donald Tusk said that Vladimir Putin’s Russia represents the biggest threat to the unity of the European Union. Is he right?" "Donald Tusk is not all the European Union. We met before, and I’m aware of his position on various matters. We met under different circumstances. To reiterate, things that a person who heads the European Commission says do not reflect the opinion of the whole of the European Union. Let’s leave that on his conscience" Note - Donald Tusk is the EU President, not the head of the European Commission. That is Jean-Claude Juncker. "You are going to go there to the European-Asian summit. Obviously, you want to talk about trade. But geopolitics obviously impacts trade. What does Russia have to offer, to put on the table, and what does Russia want in order to fix the relationship between Europe and Russia?" "First of all, I’d like to say a few words about the ASEM Summit. I think this is a fairly good platform to assess the prospects for expanding cooperation on the European and Asian tracks. Clearly, this summit is not a place where major decisions are made. In this sense, the G20 summit is precisely the venue where decisions are made. Actually, it has been playing that role since 2008. The ASEM Summit is of a consultative nature, but it is nonetheless a productive and important platform in which we participate as well. The previous summit was held in Mongolia. It was a useful meeting where the leaders of the European Union, representatives of Russia, the Asia-Pacific Region and ASEAN countries shared their thoughts. In general, all of this made it possible for us to better understand each other. If we look back on the current relations between Russia and the EU, let us face it, these relations are going through hard times. We believe that this is the result of rather hasty decisions made by the European Union itself. And I think EU residents are the ones paying for these decisions. I emphasize once again, we did not initiate them. Of course, this negatively affects our country as well. Businesses are paying for it. Ultimately, it affects the people because a significant part of trade and economic cooperation was suspended, and cultural cooperation was reduced significantly. Unfortunately, we have lost our dialogue with some countries. You mentioned Mr Tusk. Although he is a European official, he nevertheless comes from Poland. I can openly say that we have no relations with Poland at the political or economic dialogue level. Is that good or bad? I am not sure. I think this is not very good, even if we think about the specific history that links our countries. In any case, when I visited Poland at some point, I think we were much closer to establishing a dialogue. Now, this dialogue is nonexistent, and there’s nothing good about that, either." "I acknowledge that you are saying that Russia thinks that you are not the initiator in this conflict between the two, but Europe probably thinks otherwise. I have just come from Brussels and the conversation happening there most recently is about what the Dutch authorities are saying when they intercepted the cyber attacks in the OPSW, (Organisation for the Prohibition of Chemical Weapons), which is the chemical watchdog investigating the Skripal poisoning and the chemical attacks in Syria. Also, there was the coordinated accusation against Russia, from four countries, the Netherlands, the UK, Canada and the US. And you have Jeremy Hunt, (British Foreign Minister), who said that Russia is trying to foster instability throughout the world. Now, Russia does not accept these accusations, clearly. If Russia does not take these seriously, why should Russia be taken seriously when you present your country there?" "I don’t quite understand what you mean. You are saying that Russia should be perceived in some way. You see, we attend these events not to be seen in some way, or to receive marks. Estimations may vary. We attend for different reasons. We believe that it is better to cooperate than to refuse to cooperate, talking is better than not talking, and agreeing on things is better than to be in some kind of opposition. Development is better than stagnation. That’s why we take part in all international events of this kind. Any country has a right to voice its assessments. We listen to them, but Russia’s leaders and our country as a whole do not agree with most of them. But this does not mean we should refuse to communicate. Actually, I suppose that I will have to talk to different types of colleagues at the ASEM Summit. Communication always includes two parts: the first part is pre-arranged official meetings, with interpreters and video cameras, and the second part is talking behind the scenes. Sometimes the latter is even more useful, with no one rushing you and trying to transcribe it all and posting it online. But these kinds of contacts are common, and at the latest ASEM Summit in Mongolia I had many meetings with my colleagues from different countries, at different venues and even at events like the official dinner. I remember what Mr Tusk - and this is the third time we have mentioned him - said about the Mongolian cuisine as well as a number of other issues. But this does not mean that this is what political contacts are limited to." "I think you are right that there are a lot of conversations that do not happen in public, but behind closed doors. And for sure leaders will bring up very sensitive topics, one of which - especially for the UK - is the case of - I'm sure you've been asked this many times - the Skripal poisoning. The defense given by the two suspects was mocked in Europe or outside of Russia. Are you embarrassed by that reaction? Do you think it damages Russia's credibility?" Note - there was some derision within Russia, too. "You know, any evaluation like this definitely does not promote international cooperation. I remember the Soviet era, when the Soviet Union would use labels and stigmatise the international system of capitalism and talk about the things that divided us, but this did not lead to anything good. That is why we believe that everyone has to be careful when giving assessments. First, the assessments voiced by a number of countries do not reflect the actual situation, - and, namely, English one on this well-known topic - and second, they definitely are not leading us to a better tomorrow. Who benefits from these evaluations and the various sanctions imposed? Nobody. It is obvious that any sanctions most definitely lead us into a dead end. Today, we have not yet talked about our friends across the ocean, for example, the anti-Russia hysteria in the United States of America. We are perfectly aware of the fact that all that is connected with Russia and the United States now has a different goal – internal political squabbles; in fact, arguments between the Republicans and the Democrats and arguments inside the Republican Party. The same can be said about the European countries. Nine times out of ten, this anti-Russia campaign is in pursuit of entirely internal political goals: to stay in power, form a government or achieve some other goal. But certainly not to influence Russia's position. It cannot be influenced, something that everyone realises very well." "I want to talk about the sanctions and of course, about the economy, but before that I want to ask you about the two Skripal suspects, just because I want to know if you really believe that they went there to see a cathedral." "I do not know. I will not comment, just because I am not acquainted with those people, neither am I acquainted with the comments to a sufficient degree. I do not know. How can I know?" "Now I want to ask you about the US-imposed sanctions. You mentioned that that they were brought against Russia over election interference. You said that American sanctions against Russian banks would amount to a declaration of economic war. But does Russia see itself at war with America or anyone who imposes sanctions on your country?" "I have spoken out on this matter before. Clearly, the tightening of the screws in the sanctions stand-off will end in nothing good. The Americans keep saying that they intend to build up the sanction pressure. I have already said and want to repeat again that sanctions against the Soviet Union, (although we are not the Soviet Union and although the Russian state has other values, we are, nevertheless, the legal successors to the Soviet Union), were announced 10 times during the 20th century. I repeatedly mentioned this. Did it change the Soviet Union's policy in any respect? Sanctions were announced against the People's Republic of China. Did it change in any respect the course followed by the political leadership of China? And so on and so forth. Sanctions are an absolutely counter-productive idea. And sanctions against the banking sector are, in fact, a declaration of trade war. These are the hardest sanctions. But without a doubt, we will be able to overcome this kind of pressure. We don't have any doubt that our economy is able to adapt to any form of pressure. The only question is why one would need this. I mean that this tends to upset the international order, including the international economic order. Currently there are trade wars – this is what they are, as a matter of fact – between the United States and China, between the United States and the European Union and between the United States and Iran. Some of the sanctions target our country. It begs the question: does the international trading system stand to gain from this? Have the countries become better off? Or are businesses feeling more comfortable? Yes, some domestic policy objectives can be achieved in the short historic term." "How would Russia react? You said that Russia will react to this war economically, politically or, if needed, by other means. What do you mean? What other means?" "There could be quite different responses depending on the situation." "This is absolutely out of the question in the contemporary world. We are a responsible state and a permanent member of the UN Security Council. These issues fall within the terms of reference of the country’s supreme authority. These issues are within the competence of the country’s president. There are various forms of response in today’s world, including, as I said, asymmetrical responses. This is not necessarily military in nature. It is not necessary to respond to economic threats or economic blackmail with adequate economic means. This is what it is. We understand that, for example, the extent of the integration, or mutual dependence of the Russian and US economies is insignificant. American businesses are not much affected by the sanctions that the United States has imposed on our country because the amount of trade is modest. But European businesses have been hit hard because the amount of trade is huge. Currently, trade with the United States is estimated at about $20 billion – this is a low period, though. This is nothing. The amount of trade with the European Union is much more significant, as the European Union accounts for 45 percent of our trade. This figure runs into the hundreds of billions of euros. I will just give you one example. After the sanctions were imposed, our trade with the European Union all but halved, plunging from 430 billion euros to 220-230 billion euros at some point. So my question is: what losses has Europe incurred? Europe lost jobs. It lost revenue. It lost confidence even in developing small regions which, in one way or another, were centered on trade with our country. This is why sanctions are a bad approach. Actually, we keep saying this, but we did not initiate them, and we are not the ones that can end them." "Despite the sanctions the US imposed on Russia, Donald Trump seems to still be perhaps a little more friendly than others. Is Donald Trump the best thing that happened to Russia in recent time?" "We did not elect Donald Trump. Donald Trump is the President of the United States of America. We respect the choice of the American people. If there were a different president instead of Trump, we would respect him no less. As far as we can see, Donald Trump is having a hard time because he is being attacked by the right and by the left. On the one hand, he is suspected of having some sort of sympathy towards our country even though he actually has not yet done anything to radically improve relations between our countries. And he is unlikely to do so due to the pressure being put on him. And on the other hand, he is being pressured in other areas." "Talking about pressure. I'd like to bring up the pressure internally in Russia. We have seen protests on the streets maybe because of the pension reform; there were pictures of you, actually, people were writing “enemy of the people” on your picture. Are you worried about the discontent in the street now? Is your party pursuing austerity, and are you worried about this discontent?" "Do you now mean the situation in our country?" "Any changes in the country are naturally viewed differently by the people. If you mean the issues related to changes in pension legislation, such reforms are never made easily in any country. These are complicated reforms that make people worry about their lives. Nevertheless, and I have said this a number of times, these changes are necessary. And we resorted to those measures bearing in mind that such reforms were necessary in the absolute majority of countries that had reached a certain level of development and certain living standards. This is why these decision are taken. I mean to say that now the living standards are different and life expectancy in our country has increased to 73 years, which makes the situation radically different from what it was, say, in the 1940s or 1950s when the retirement age was set. This is an objective, although difficult, reality." "But are you worried about how serious it is ?" "I think the explanation that was given and the amendments that were made to the bill, the amendments that were eventually approved and signed, alleviated some concerns. So I think that overall the situation will calm down soon." "I am going to go to Syria now. Some would argue that Russia has achieved its goal over there, taking the lead and essentially sidelining the US. What kind of guarantees can Russia give to the Syrians that they can come back and their lives will be better under Assad than when they fled? Because Russia wants to rebuild it. What guarantees can they give the Syrian people?" "Syria has indeed suffered a great deal. I went to Syria in 2010. And Syria at the time left a very good impression on me compared to the other countries in the region, which I have said repeatedly since then. It was an ordinary, modern and relatively secular state where representatives of different faiths lived side by side peacefully, including Muslims, Christians and Alawites who are treated differently by different religions and different states. Currently, the circumstances in Syria are, of course, completely reversed. In my opinion, the goal for the global community is to make sure that peace is restored on Syrian soil. Naturally, at the request of the Syrian state, the Syrian leadership, we are helping to restore order. The president has attested to this multiple times and it is a transparent situation. But we hope that it will be over, that Syria will elect its leaders and enter a recovery phase. Some rules will change. A national dialogue will be put in motion. Only then will it be possible to bring peace back to Syria. We are ready to help in every possible way."